The style of this original table lamp evades determination. The sides of the trapezoid lampshade differ from each other while all are made from rare types of natural veneer. The sides and the top are decorated with large insertions of jewelry resin with dried flowers. 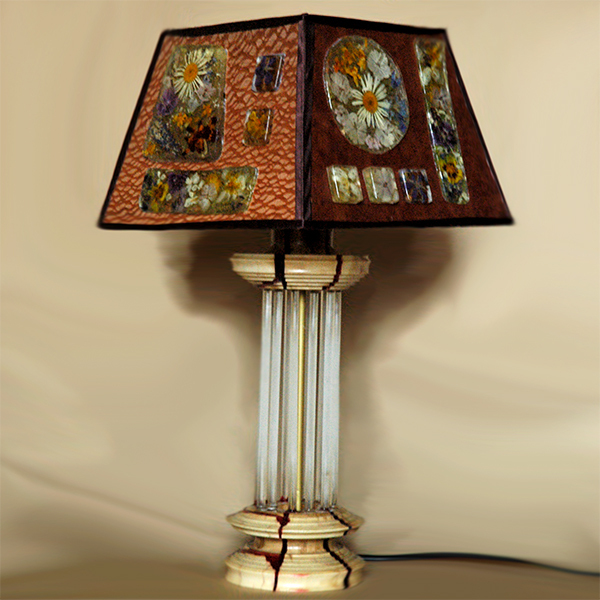 The base is carved from poplar wood, decorated with jewelry resin and connected to the pamlshade with long glass rods. The light radiating through the pieces of resin in the dark completely transforms the lamp, creating the atmosphere of comfort and cosiness.